If you can easily distinguish between retracement or reversal then it is not impossible if you can make easy profits in your trading. In a simple easily understood Reversal of Meaning = reversal (change of trend). 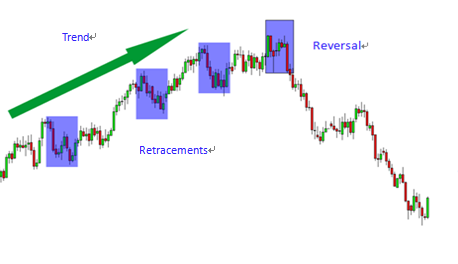 While retracement means the temporary reversal, or a temporary reversal. You could say a retracement that excessive means Reversal. The first way is quite popular is to use Fibonacci levels, generally a value or retracement area will range in 38.2% 50.0% and 61.8% before the move to continue the overall trend. If at this level can range passes, most likely there will be a trend reversal. Areas with a picture of purple is a retracement level, at the first instance to the retracement occurs in the range of 68% Fibonacci level, and the second example in the range of 50% Fibonacci level. Also visible in the picture that the retracement is temporary trend reversal, to then follow the trend of parent / early (in the example image uptrend / Bullish). The 2nd method, to identify a retracement is to use a pivot point analysis. By using pivot points, the trader relies on the support and resistance calculations, where usually there are 6 levels / points which are calculated ie, S1, S2, S3 and R1, R2, R3. First support means S1​​, R1 means the first Resistance, and so on. So if the trend of rising prices move upward bounce back after touching S1, then this is a retracement. But If the price continues to S2, S3 and then it’s likely to happen reversal trend = Reversal. The third way, using a line identifying the retracement trendline. Basic analysis is that if the trend line passes (break) then Reversal, if that means retracement bounce back. * So a reversal pattern will we identify the first time as a retracement. But if this continues then the retracement happened is a reversal. * Even with such methods as described above which shows a retracement pattern / reversal, but still no reply to make sure the end result when trading closed today. Experience and time in front of the pc to learn market movement still could not replaceable that will make you more easily to identify retracement or reversal. * The following table will present comparisons between Reversal and retracement criteria, may be easier for you to identify. Occurs when the trend is formed with strong or after a strong price movement. It could happen anytime. One of tips is using strong support resistance on daily time frame for filtering our trading decision and calculate our risk reward and don’t forget back to forex basics in reading depth market movement. Don’t forget to try proven and tested swing forex trading strategy and channel forex trading strategy based support resistance combined with overbought and oversold area based high time frame. You try in free 50usd no deposit bonus forex account first to start this forex reversal strategy.